After 27 years service at Howards Peugeot Weston-super-Mare, Michael Bavin has announced that he will be retiring from the company at the end of June this year. Until then Mike will be undertaking a number of important Aftersales projects on behalf of the Howards group as a whole. Mike has made a huge contribution to the dealership over many years and will be greatly missed on his departure in the middle of the year. The challenge of replacing Mike has fallen to another of Howards most talented and motivated Service Managers, Dave John. Dave is taking up the reins and returning to manage the Service Department at Weston-super-Mare following many successful years leading the Service Department at our Peugeot site in Taunton. 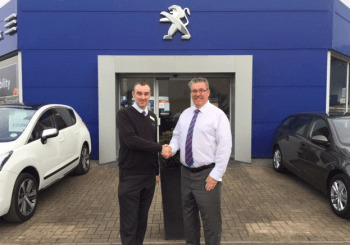 Dave has a wealth of experience with Howards and the Peugeot brand. After starting with the Group in January 1994 as a service technician, he worked his way through the ranks from Master Technician to Workshop Controller and then onto Service Manager at our Honda branch in Weston-super-Mare. He remained there for 7 years during which time he took the Service department to 1st place in the UK for customer satisfaction. Dave is delighted to be back on home ground as he lives with his family in Weston-super-Mare and this is where it all began for him back in 1994. When you are next in the area pop in and Dave will be happy to introduce himself. He prides himself on providing excellent customer service whilst ensuring customers receive the quality of workmanship and value for money expected from the very best of dealerships. Dave and his team look forward to welcoming you to Howards Peugeot in Weston-super-Mare in the very near future.